The founder of the Yungdrung Bön tradition is the Buddha Tönpa Shenrap Miwoché. 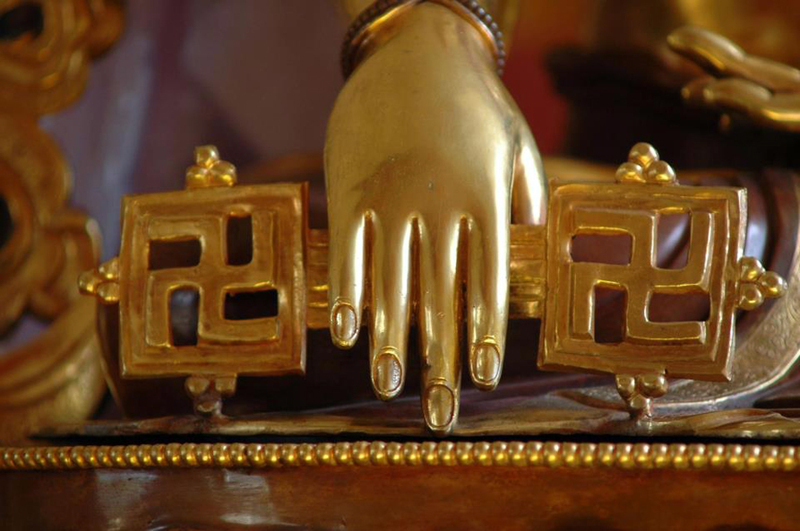 His right hand is in the mudra of subduing the earth and holds a chakshing. The chakshing has two yungdrungs which represent the unchanging and unceasing nature of the absolute truth. These qualities also refer to the true nature of the mind that is beyond concepts and is indestructible. Posted on August 27, 2013, in Tibetan Culture & History, Tibetan Lamas, Uncategorized and tagged Asian studies, spirituality, tibet, yungdrung bon. Bookmark the permalink. Leave a comment.